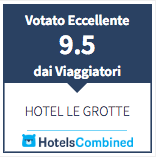 Hotel Le Grotte — Albergo e Spa a Genga (AN). Prenota ora online! It is surrounded by the colours of the Gola della Rossa and Frasassi Park. Here the 30 years Bardella Family’s hospitality becomes richer and richer adding to the culinary tradition the 4 star hotel and the new wellness area, together with a staff ready to cuddle every customer. 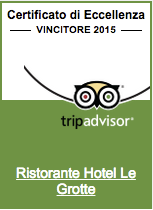 Founded in 1979 by the Bardella Family, the restaurant is the real heart of the resort. Today the chefs Mattia and Luca, together with the owner Luciano, still continue to follow the same philosophy, preparing delicious authentic flavoured dishes using very genuine local products. Chease and cold cut, truffles, meat, are local and carefully selected. The offer is completed by the Marche wines, overall the white Verdicchio dei Castelli di Jesi e Matelica and the red Lacrima di Morro d’Alba. The 23 rooms are all really wide, well furnished and comfortable. A lot of them have the balcony with a special view on the garden and mountains. The panoramic suite offers an unforgettable atmosphere, with a spectacular view on the Gola di Frasassi. The offer is enriched in 2010 by the new wellness center “Ile Spa”. Here our beauticians apply professional products without forgetting sensory and relax needs. Next to this is located the thermario which is equipped with Jacuzzi, sauna, Turkish bath, emotional showers, Kneipp and a relaxing room. The new banquet hall is ideal for weddings, parties, meetings and congresses. In the large garden surrounding the hotel a new outdoor pool with Jacuzzi, a relaxing waterfalls and seducing light effects, brings a touch of magic to every stay. P.IVA 00324700426 — Tutti i diritti riservati. Prenota direttamente con noi alle condizioni più vantaggiose!